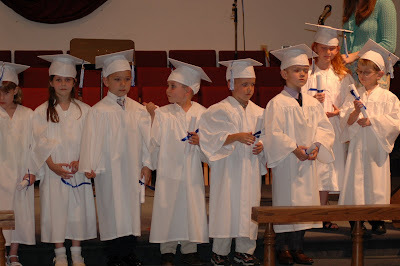 Kindergarten graduation, Georgetown, Kentucky. Click for LARGE. Sara Robinson, to Managing Editor. The Littlest Gator, to Staff Writer. Evan Robinson, to Staff Writer. Maggie Jochild, to Staff Writer. Minstrel Boy, to Staff Writer. Sara Robinson is an extraordinary futurist and writer. She is a Fellow of the Campaign for America's Future where she blogs at the Blog for Our Future. She will complete her MS in Futures Studies from the University of Houston in 2009 and holds a BA in Journalism from the USC Annenberg School of Communication. She is a principle blogger at Orcinus and a co-founder of Group News Blog. Over the last year, Sara's many years of new media and journalism experience have saved and guided us, over and over. The Littlest Gator is the Managing Director of an extraordinary restaurant, first opened in Tokyo's trendy Omotesando District, with a second version now open in Kona, Hawaii. She manages a staff of 50 people. The restaurant's commitment to local, fresh food is so enormous they have purchased their own farm on Hawaii so as to ensure the quality of their supply, its variety, and to guarantee it is grown without harmful chemicals. The food they are unable to use themselves in their restaurants on Hawaii and Japan, they sell to local customers. Evan Robinson was one of Electronic Arts' first computer game developers and later became a Technical Director, one of the people who says if a product ships or not. He went on to be a Senior Computer Scientist at Adobe, ultimately accountable for a core portion of Adobe Acrobat. He spent twenty years in Silicon Valley, working his way up to being a Technical Director, Engineering Manager, and Consultant. He holds a MBA in Management of Technology. Maggie Jochild is a poet and a writer. She is currently writing "The Great American Lesbian Novel", Ginny Bates. Maggie is a radical dyke second wave feminist activist. She was one of the most widely active agitators of the 80s on the west coast, and helped start The White Night Riot. Minstrel Boy is a professional musician, a member of the Apache Nation, and makes delicious truffles. He made three tours with Seal Team Two in Viet Nam.